Basma Al Sulaiman dedicates her time and energy in building her Contemporary art collection combining Western and Middle Eastern art. Supporting and promoting emerging Contemporary Saudi artists, Keen on establishing intellectual and artistic links between her home country and the West, Basma is considered as a Saudi Art Patron and she is the founder of BASMOCA (Basma Al Sulaiman Museum of Contemporary Art). Basma was born to parents from the Qasim province, central Saudi Arabia and was raised in Jeddah. Basma gained a Bachelor of Arts in English Literature in Jeddah and, some years later, took the diploma course in Modern and Contemporary Art at Christie’s.A love of international travel brought Basma into contact with contemporary art and she began to collect by instinct, her first acquisition, a David Hockney, was bought in New York before she even really knew the identity of the artist. She relished the challenge and began to collect in earnest, bringing home to Saudi works by Frank Stella, David Mack, Renier Fetting and Luciano Castelli. In 2004, Basma started looking into Chinese contemporary art. Travelling all over China, visiting artists’ studios and young galleries, Basma bought from artists such as Yue Minjun, Zhang Xiaogang, Zeng Fanzhi and Zhang Huan. In 2011, Basma Al Sulaiman launched BASMOCA ; BASMOCA is the first virtual museum to present an actual private collection to a limitless global audience of visitors. It allows its visitors to create avatars and interact with each other as they are walking through the museum filled with Basma’s collection with a range of Western, Middle Eastern art and a large number of Contemporary Chinese artworks. “ I want to share my vision with other people. By embracing technology, we can make the collection available, all over the world, to as many people as possible. Basma’s main focus is to promote works of art globally through a new global technology form such as an online Museum allowing any individual from anywhere in the world to have constant access to her curated show. Basma supports Saudi art and artists and enables their international promotion through her online platform. 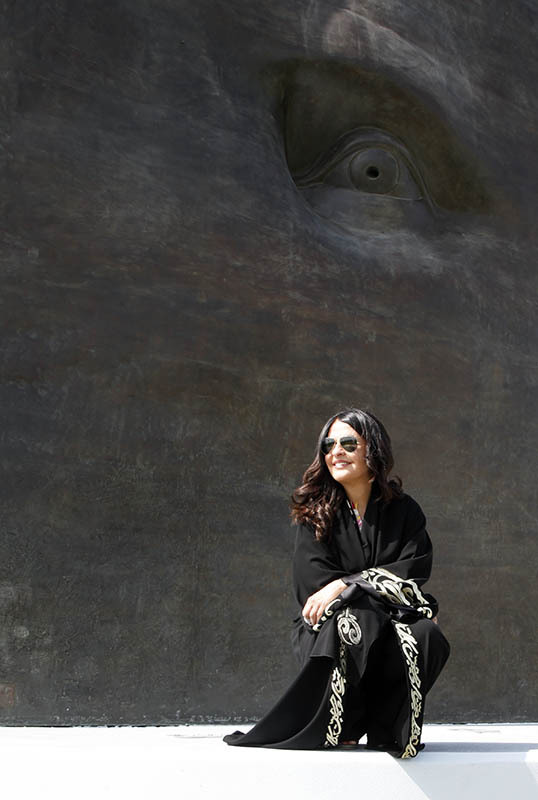 Aside from BASMOCA, Basma is one of the founding members of the Saudi Art Council and the brain behind Jeddah Sculpture Park. In 2014, she received an award from the Saudi Government, being the first Saudi woman to be honored for her contribution to Saudi’s Art and Culture. After the passing of her beloved young son Mohammed Al Juffali in 2012, Basma has dedicated her art collection and museum loans in his loving memory. She is also a member of many charities, both locally and internationally. Welcome to my museum, carved out of a dream. I have been a lover of art for as long as I can remember, and the instinct to collect was intrinsic to my character since the very early days. After building a small collection, I began to realize that I wanted to share it with everyone but this seemed to be an impossible ideal. Overcoming physical distance and cultural boundaries, being globally accessible to people with just one click of the mouse seemed to be an impossible dream. This concept of bringing people together in an inclusive arts arena was so persistent that I could not stop exploring possibilities; how could I harness the on-line tools available to provide a destination for people to come to look at contemporary art? We are very fortunate to live in a time when modern technology can realize such dreams and I am pleased to present BASMOCA, one of the first museums of its kind. BASMOCA is virtual but with a true life experience derived from the fact that the collection is real. It is an entirely interactive experience, quite different from looking at photographs of the work, and you can explore the world of BASMOCA in the knowledge that everything you see exists in concrete form, as part of an ever-expanding collection. Now let’s go on our journey of art exploration !